Drs. 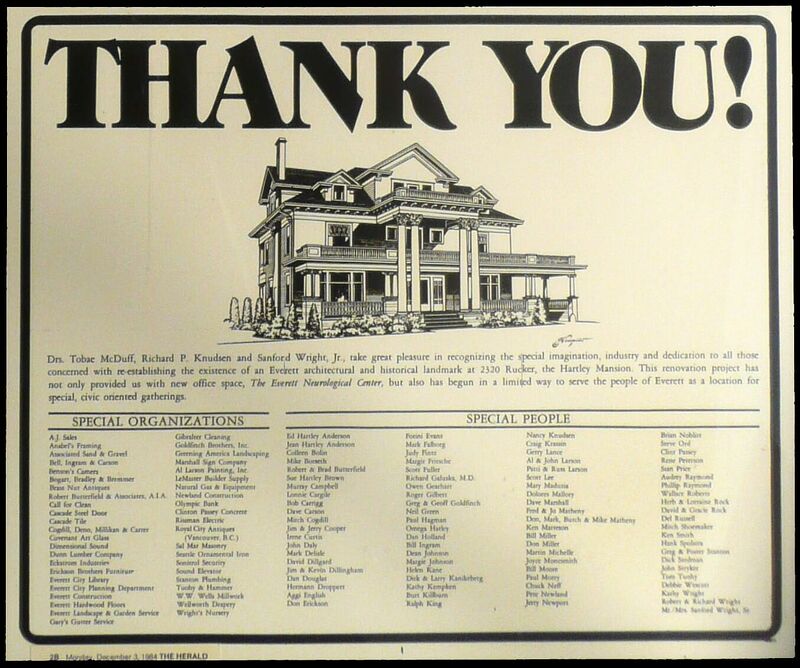 Tobae McDuff, Richard P. Knudsen, and Sanford Wright, Jr. take pleasure in recognizing the special imagination, industry, and dedication to all those concerned with reestablishing the existence of an Everett architectural and historical landmark at 2320 Rucker, the Hartley Mansion. This renovation project has not only provided us with new office space, The Everett Neurological Center, but also has begun in a limited way begun to serve people of Everett as a location for special, civic-oriented gatherings. Robert Butterfield & Associates, A.I.A. Mr. & Mrs. Sanford Wright, Sr.